Kirtan is a practice of Bhakti Yoga, the yoga of Devotional Love. During kirtan, the “leader” will sing a “call,” chanting one line of a mantra, and then everyone else sings the “response,” simply repeating or singing back what they heard. In this way, an energy exchange is created, in which we are singing back and forth to each other, giving and receiving, and sharing healing vibrations. Musical experience is not required. Kirtan is not about having a “nice” singing voice- but is about expressing the love and the longing in your heart. All are encouraged to sing, clap, sway, dance, and enjoy the music and the mantras. Or simply sit back and enjoy. 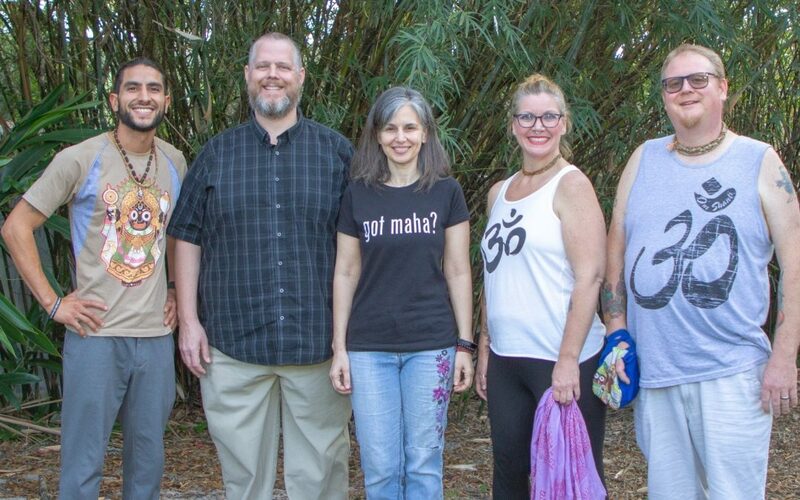 MAHA is a kirtan band based in Sarasota, Florida. Their music is easy to chant along with, and they are delighted to share the love and the joy of kirtan with you. Advance reservation $10 per person, $15 at the door.